The Great Deficiency in the discussion of German War Planning before the 1914-18 Great War has been the dearth of reliable primary sources. Very little was in the public domain before the German Reichsarchiv was destroyed in April 1945, and this problem is compounded for Anglophone historians by the fact that the most interesting secondary literature was printed in German periodicals in the early 1920s. 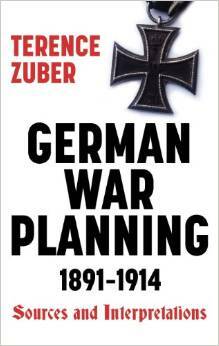 This book makes available in English translation many of the documents concerning German war planning before 1914 that survived the Second World War. They had been closely guarded by the East German army archives, and only became available with the fall of the Berlin wall. Included are: Wilhelm Dieckmann’s ‘Der Schlieffenplan’, assembled from archive sources; Hellmuth Greiner’s account of the German west front intelligence estimate from 1885 to 1914; and two of the younger Moltke’s General Staff exercises. The book also presents other little-known documents found in the German archives as well as the most important 1920s literature concerning the debate on the German war plan. The picture of German war planning which emerges from these documents is both more complex and more credible than previous analysis focused entirely on the ‘Schlieffen plan’ has allowed.